2016 was the year of live streaming and it played a crucial role in driving growth. All of the top 6 social apps, except WeChat, have added live streaming services, according to the report jointly published by Cheetah Global Lab, Cheetah’s big data platform libra and 36kr. As WeChat is maturing as a user acquisition platform, we’ve introduced some other Chinese social apps that startups can use for growth hacking, such as Weibo, Momo, Baidu Tieba, and Zhihu, which also appear on the top ranking. Sina’s Weibo was said to be declining as a social app, however, it topped the list again last year, as the company devoted itself to short video and live-streaming. Momo, a location-based social network, also added live-streaming function and gathered a handful of users and revenue around it. It is still used as a hook-up app along with Tantan. Mobile advertising serves as the largest revenue source for Momo, followed by membership subscription, based on its second half 2015 report released last year. Baidu Tieba is a 13-year-old service of Baidu where Chinese people form communities to discuss their interests and topics. Last year July, Baidu confirmed that it will not commercialize Tieba forums as Baidu is embroiled in health-related scandals last year. Tantan, a Tinder-like mobile dating app in China, raised a 32 million USD series C funding in May last year. Tantan has not applied monetization plans to its app and said it will keep trying to attract daily active users before they launch a paid version. 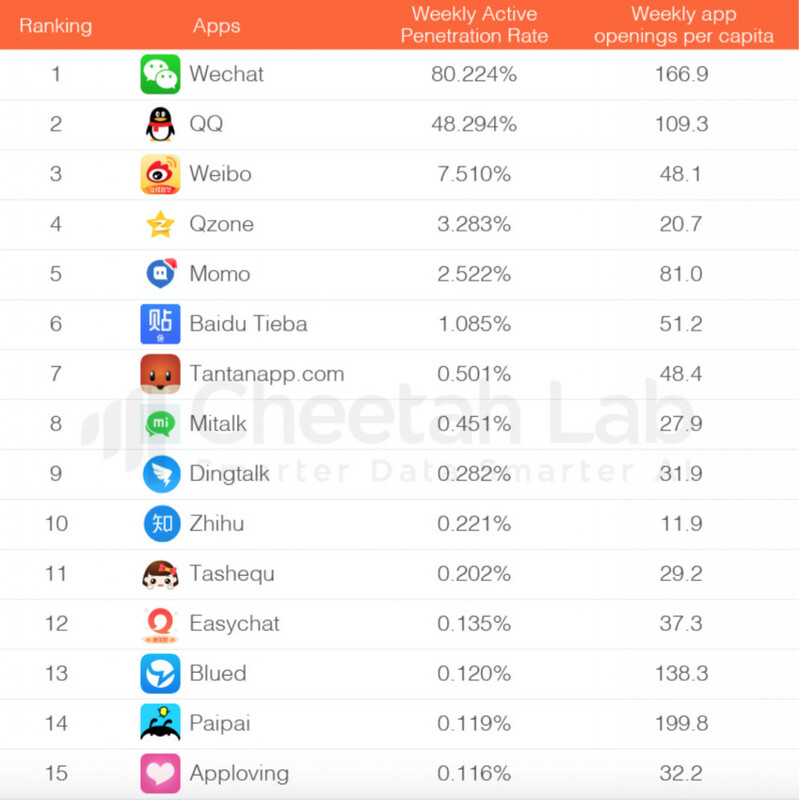 MiTalk, the mobile messaging app by Xiaomi, ranked 8th. It first launched in November 2010, earlier than WeChat. The chatting app allows users to buy Xiaomi products without leaving the app. Dingtalk, an office communication app launched by Alibaba in 2014, ranked 9th, quickly catching the people’s needs for dedicated office communication app, as We Chat users were feeling the pain of not being able to separate their personal life from their professional life. WeChat, for that reason, rolled out enterprise version for WeChat in April last year. Zhihu is a platform for Q&A service and a freshly born unicorn. The knowledge sharing company announced the completion of 100 million USD series D this month. Zhihu started its live function Zhihu Live, giving the revenue source to the KOLs in its app. People should pay a certain amount of fee to join one-on-one sessions with a topic expert. Interestingly Blued, a gay social networking app ranked the 13th. The app quickly responded to live streaming trend, adding live streaming function to its app. In June 2016, the company raised hundreds of million of RMB in series C round and C+ round. Douban, a popular social platform for topics around culture, books, and films fell out of the top 15.